The humanitarian crisis in Yemen remains the worst in the world. Nearly four years of conflict and severe economic decline are driving the country to the brink of famine and exacerbating needs in all sectors. An estimated 80 per cent of the population – 24 million people – require some form of humanitarian or protection assistance, including 14.3 million who are in acute need. Severity of needs is deepening, with the number of people in acute need a staggering 27 per cent higher than last year. Two-thirds of all districts in the country are already pre-famine, and one-third face a convergence of multiple acute vulnerabilities. The escalation of the conflict since March 2015 has dramatically aggravated the protection crisis in which millions face risks to their safety and basic rights. 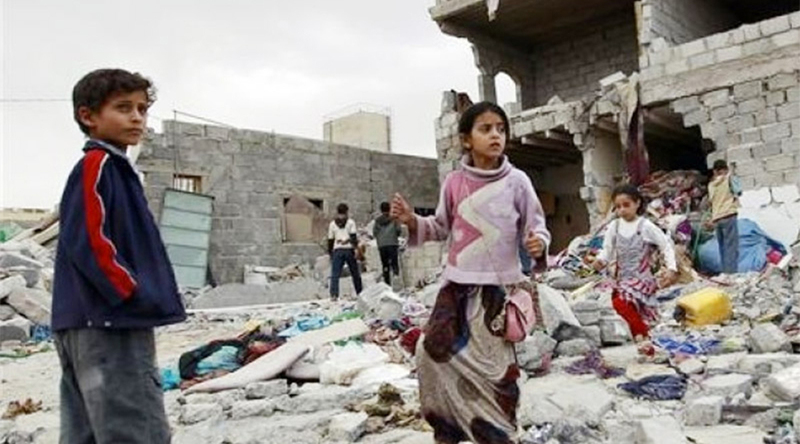 Beginning on March 26th, 2015, the Saudi-led coalition has perpetrated numerous military attacks & extensive war crimes in Yemen, causing countless casualties & immense suffering. The Saudi military targets schools, factories, hospitals (including Doctors without Borders mobile clinics) and even funeral processions. In August 2018, Saudi authorities admitted that mistakes had been made, leading to the bombing of a school bus that killed 40 children between the ages of 6 — 11 years old, as well as 11 adults. In the same month, the Saudi-led coalition bombed a fish market and hospital, killing 55 civilians and injuring over 170. According to Save the Children, at least 85,000 children may have starved to death because of the conflict and many of those deaths are a direct result of the Saudi blockade of Yemen. UN human rights experts, and international human rights and humanitarian organizations have all decried the fact that it is evident that Saudi-coalition forces fail to draw the distinction between military and civilian targets in their attacks. All of this occurs against a backdrop of impunity and a failure of accountability. The Saudi-led coalition continues to bomb and blockade Yemen without consequences, meaning that the famine, cholera outbreak and other humanitarian concerns only worsen. We cannot forget that these are the same authorities who pushed former UN Secretary General Ban Ki-moon to drop Saudi Arabia from the “list of shame” in his 2016 report to the UN Security Council on children and armed conflict; a decision he described as, “one of the most painful and difficult” he had to make. You are of course aware, Prime Minister, of Saudi Arabia’s long history of extensive human rights violations. These violations are not limited to the war in Yemen. Recent concerns have included the torture, unjust imprisonment and unfair trials of women’s rights activists in the country, as well as clear Saudi responsibility for the murder of journalist Jamal Khashoggi inside the Saudi Consulate in Istanbul, These grave human rights violations have in turn propelled growing numbers of Saudi citizens to flee their country, seeking asylum in many countries including Canada. Prime Minister, Canada has positioned itself globally as a country that advocates for human rights, under all circumstances. Canadians take pride in this commitment to peace, rights and justice. That is why there is such disbelief and deep concern about the fact that Canada continues to sell arms to the Saudi regime and that your government has failed in particular to halt the sale of $15 billion worth of Canadian-manufactured light armoured vehicles to Saudi Arabia. Our organizations have called on all governments to stop selling arms to Saudi Arabia and all countries involved in the fighting in Yemen. Some have now taken that step. It is time for Canada to follow suit. Mr. Prime Minister, this is our second letter to you making this urgent plea. We wrote a similar letter to you one year ago, on March 26, 2018, endorsed by 24 Canadian organizations. Beyond a confirmation of receipt, we did not receive any substantive response to that letter. We hope that you will engage with us this time and we hope that we can schedule a meeting with you or your officials to discuss this important matter. We have included articles of proof and endorsements as well. We thank you in advance for your consideration of our requests.